Recently we’ve been following the story of the biggest war in gaming history kicking off inside EVE Online and its far-reaching consequences for the EVE universe. The conflict that has come to be known as World War Bee has seen EVE‘s largest and most dominant military power (known as CFC or The Imperium) face off against a huge coalition of alliances calling itself the Moneybadger Coalition. The story so far reads like something out of a sci-fi novel, except that it’s playing out right now inside EVE Online, so if you’ve missed it, then I recommend going back and reading our coverage of the war from the beginning. In our last report, the Imperium was up against a wall and unable to match the fleet sizes fielded by MBC. The group walled itself up inside the uncapturable lowsec system of Saranen and switched to guerilla strategies, employing interceptor and stealth bomber fleets. Since then it’s lost billions of ISK in strategic assets, it’s given up dozens of star systems and stations, and it’s been shedding members by the thousands. The Russians have unexpectedly entered the war, director level spies have been discovered, and Goonswarm’s home fortress in Deklein is under assault. Now The Imperium itself looks as if it may be shattering, and its only hope may be to consolidate its power into one massive super-alliance. 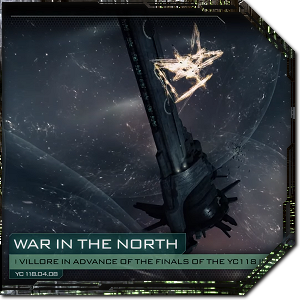 Read on for an update on the latest from EVE Online‘s World War Bee, the toll it’s taking on the alliances involved, and The Imperium’s plan to form what players are calling a super-alliance. The Imperium has been up against a wall for most of this conflict, making a strategic decision to hold back its war assets and allow its territory to be captured. 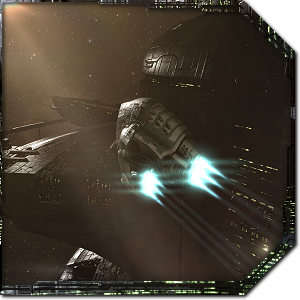 Key systems that many expected to erupt into the largest battles EVE has ever seen are being captured without opposition. Imperium players who want to fight an actual war have found limited gameplay opportunities, and member alliances have been left undefended by their allies. Thousands of players have left Imperium alliances over the past few weeks, and three major alliances have now officially severed ties with the coalition. Circle of Two switched sides early in the war, and more recently SpaceMonkey’s Alliance and Fidelas Constans have called it quits. SpaceMonkey’s Alliance has been a priority target in this war due to a dispute with MBC financier Iron Bank. The alliance has now lost almost all of its territory and stations in this war, and over half of its membership has already abandoned ship. Fidelas Constans got off a little lighter, losing only 1,000 pilots but facing a war on multiple fronts in the Branch region with no hope of defensive support from allies. 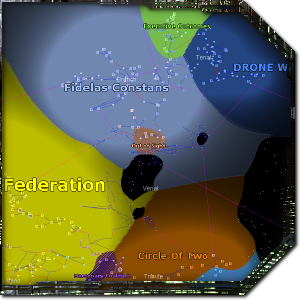 SpaceMonkey’s alliance now plans to rebuild in the Outer Ring region, while Fidelas Constans will soon go on the offensive and capture some nullsec space for itself. Both alliances leave The Imperium on good terms. 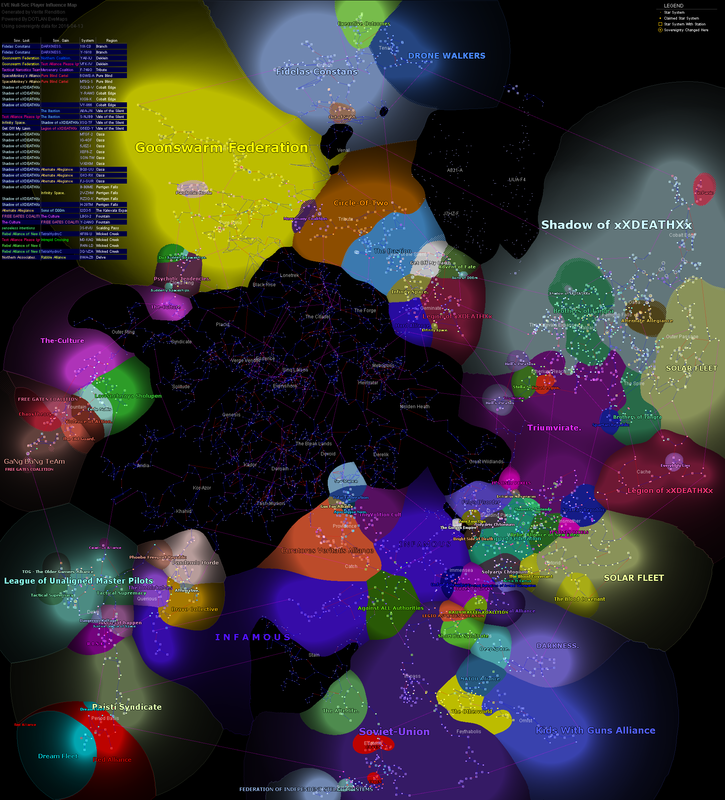 World War Bee has already made a huge impact on EVE‘s political landscape, with Razor Alliance, Tactical Narcotics Team, SpaceMonkey’s Alliance and The Initiative being essentially wiped off the map. Goonswarm’s home in Deklein is now being captured, and its Titan construction facilities have been destroyed. The war also took an interesting turn when it became clear that new Russian alliance DRONE WALKERS was seizing the opportunity to capture the Tenal region from Razor Alliance. They’ve now drawn the ire of fellow Russian alliance Legion of xXDEATHXx, potentially drawing them into the conflict. Every group involved in this conflict seems to have its own set of priorities and goals. Some in the MoneyBadger Coalition will be content to wipe the Imperium’s alliances from the EVE sovereignty map, while others have said they won’t rest until Goonswarm Federation itself falls apart (a goal that can’t be achieved through brute force). There are even those calling Imperium leader The Mittani a tyrant and people hoping for a full-scale revolution against the coalition’s leadership. Several people in Imperium leadership positions have leaked alleged chat logs of internal discussions over the past few weeks, and one Goonswarm director-level spy who had been leaking information to Reddit throughout the war was unmasked by an IP sniffer trap. Is forming a super-alliance the answer? The Imperium seems to be sticking with its plan to cede territory now and then unleash retributive hell, hoping that the MBC won’t remain a united front forever. In an article entitled “Forging the Goonhammer,” Imperium leader The Mittani announced plans to absorb willing corps from departing allies directly into the Goonswarm alliance to create a massive super-alliance. Consolidating into one huge alliance makes sense for defense, as Aegis sovereignty makes it difficult for two allied alliances to defend each other’s space directly (even though attackers have no such difficulty). The plan to form a super-alliance could be a response to the recent recruitment efforts of Moneybadger members such as Pandemic Horde, Test Alliance, and The OSS, which have collectively grown by over 4,000 members since the war began. The offer has had a minimal response so far, however, with only a few hundred pilots in a handful of corporations joining Goonswarm since the announcement. The alliance is still officially the largest in the game at 18,185 registered members, but a true count is difficult to make as Goonswarm does not purge inactive members. The best estimate of relative strength we have comes from killboards, which show that 3,466 Goonswarm members have been active in PvP in the past 7 days, compared to EVE‘s second largest alliance, Pandemic Horde, with 2,342 active pilots. While it’s clear that The Imperium is shattering and its territories are being conquered, Goonswarm Federation seems to be alive and kicking and the final outcome of this war is still far from certain. The conquered space is easy to recapture as its strategic indices get reset when the infrastructure hub is destroyed, and we have yet to see who will finally decide to live in and defend the conquered space. The Imperium may still be hoping that fighting will eventually erupt between the various alliances vying for a slice of the newly conquered territories, presenting an opportunity for counter-attack. If the MBC breaks down and Goonswarm Federation can field larger forces than any individual alliance, it may be able to press the superior number advantage again. Shifting alliances and political motivations could still have a huge part to play in this war as it evolves, and the only thing we can be certain of is that neither side is going to go down easily. EVE right now feels as if everyone is running around drenched in gasoline while flicking lit matches at each other, and it’s freaking awesome. my take away is goon will deny CCP exploiting this war to drive subs. by not fighting big wars that catch eyes. they have decided to play the troll card. omg you mean biggest galactic battle in it? VariantReality Kherova or, y’know, different strokes for different folks. I tried eve numerous times, but routinely just found the game dull. So am I reading this right…Goonswarm are getting their asses kicked? VasDrakken Goons are not 1/10 of 35 thousand players. I doubt they have more than 1000 players logged in any timezone including the eu/us peaks. Of those 35 thousand players 80% are in highsec, a lot of them never heard about this war, never went into other security systems, etc. Another players are in other parts of nullsec or lowsec, not interested in war either on individual or alliance level. Another ones are in wormholes, definitely not interested in anything related to k-space. However, this attitude is changing. More and more people on rookie help channel are asking about the war, how to join, how to do some PVP, and so on. This war brings in new people, and it brings them into nullsec. IT’s awesome. Smiggins OrobNinebands I assume he’s referring to the fact that the EVE server only operates on 1 second ticks, which means there’s no fine control or rapid response – the server only registers what you’re doing and responds once per second (or up to once per 10 seconds in heavy time dilation). If you could actually change that (which I’d guess would require re-writing huge chunks of the game’s code base, a massive and expensive undertaking) you’d run into hardware limits very quickly – even with the servers only having to process inputs and send out updates once per second, it’s still fairly easy for large fleets to push regular nodes into time dilation, where the server slows down tick speed to have more time to process each one. If you increased that 30-60x or more to enable flight sim controls then basically anywhere with more than 10 people in local would be in time dilation all the time. Technical limitations. Flight sim controls require far more bandwidth than pseudo-RTS, and are far more negatively impacted by latency to boot. OrobNinebands Yeah, I’ll agree with both those points. I think there’s value in having the option to escalate any disagreement into spaceship violence, provided that there’s a significant cost associated with doing so outside of corp wars and other legal fights. Sec status and kill rights from ganking work well as such a deterrent for most players – a miner or mission runner is rarely going to want to give out a kill right that can then be used against them, for example, plus you can’t mine, mission, haul, explore or run combat sites in hisec if the faction police are after you because your sec status is too low. The problem (IMO) is that people are side-stepping those mechanics with dedicated gank alts – they can still gank with -10 sec status, which is the only thing that character does, and kill rights are largely useless even when their sec isn’t low enough to make them free targets because they’re only flying disposable gank ships anyway and they usually go straight from a station undock to a target they’ve picked out with a non-ganking scout character. So the consequences of ganking, other than the ship loss, are rendered non-applicable to them; they’ll never have that KR used against them while they’re PvEing, because they don’t PvE on that alt. Personally I’d love to see a player-operated solution that would allow players using it to cripple gameplay for those with low enough sec that faction police start chasing them. Imagine a bubble that only affects players with criminal sec status, for example – drop one on every station undock in Niarja/Uedama plus a few more around the main gates, suddenly CODE. freighter gank fleets are sitting ducks for anti-gankers to pop because they can’t use insta-warp bookmarks to get off grid. At the same time there’d be no effects on ganking if players aren’t using the tools – someone AFK mining in a Mack is still just as much a target as they were before, for example, which isn’t the case if CCP buffs NPCs instead. The obvious counter would of course be to use tags4sec to buy sec status back, but that’s actually fine too – it switches the consequence from “get stuck in a bubble and alpha’d by a tornado” to “spend a notable amount of ISK to buy my sec status back”; ganking is still an option, but if you want to make a career out of it you’ll need to be very careful where you operate or rat in lowsec for tags or spend a lot of ISK to buy them so you can keep bribing CONCORD. With most of CFC’s supers trapped in what is now a rapecage pos with no chance of getting them out, alliances such as PL and NCdot will be staying for a very long time. Also worth mentioning that Pure Blind has a sick ammount of money moons which will continue to feed those two alliances with isk. So regions such as Deklein will be close to impossible to win back without massive losses for the CFC. There is also the point that a lot of alliances in the CFC might not agree if Mittens desides that Deklein will be the main focus of recapture, considering all the other homes that have been lost in this war.